Our two main areas of interest involve using in vivo imaging models to interrogate the tumor microenvironment and examining communication mechanisms used by cancer stem cell to promote their maintenance. Currently our work is focused on malignant brain tumors but our technology and interests are applicable to many other tumor types. To achieve this goal, we rely mainly on in vivo two photon laser scanning microscopy. 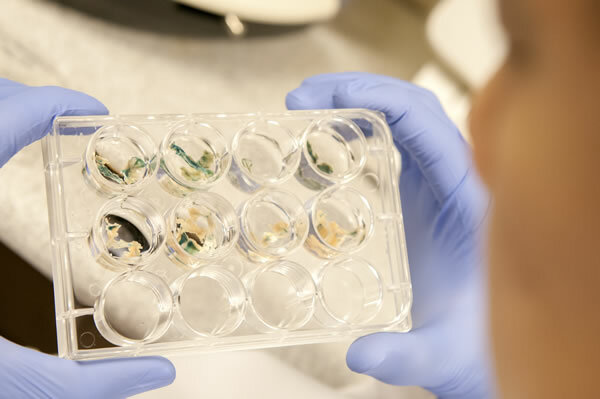 We have models in which we transplant labeled human brain tumor cells and can watch tumor development in real time. We can also evaluate tumor cell behavior in slice cultures, which allows us to evaluate the molecular contribution of the microenvironment and more appropriately model the human tumor microenvironment. We are in the process of adapting a currently used brain tumor model to be more amendable to in vivo imaging. We also have active collaborations imaging neuroinflammatory processes. Cells are driven by two main cues an intrinsic and extrinsic program. Within the extrinsic programs, we are interested in how tumor cells interact with one another and the specialized extracellular matrix present in the tumor microenvironment. These interactions drive stem cell maintenance and may represent a new therapeutic angle for tumors. Cancer is a disease defined by complexity and it has recently been appreciated that many lethal tumors contain a high degree of cellular heterogeneity. Moreover, tumor cells are organized in a cellular hierarchy, with a cancer stem cell at the apex. Cancer stem cells have been characterized in a variety of cancers, including malignant brain tumors, and have been shown to be responsible for tumor formation and therapeutic resistance. Our main interest is how cancer stem cells from malignant brain tumors interact with their surrounding microenvironment, which provides signals to preserve the malignancy of these cells. Specifically, we are interested in cell to cell communication mechanisms as these will help better define the biology of this population and may serve as potent therapies. To fully appreciate cancer stem cell interactions in the appropriate microenvironment, we are developing imaging models to study the communication in real time. Hormone therapy for breast cancer blocks cancer cells from interacting with hormones such as estrogen and progesterone, which fuel the cells to grow and spread. Triple-negative breast cancer (TNBC) cells, however, lack the receptors needed to bind to these hormones and growth factors. Without such receptors, typical therapy does not work, contributing to poor survival rates for women with TNBC. 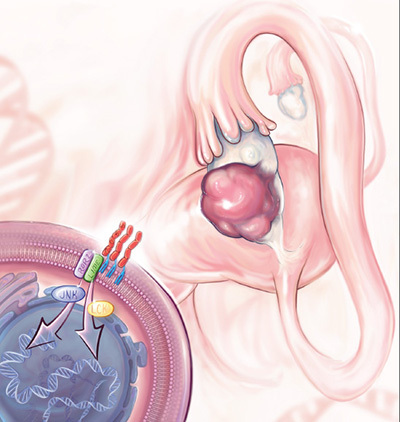 For the past 25 years, standard therapy for endometrial and ovarian cancers has included surgery and the chemotherapy drug cisplatin. While these treatments typically are initially successful, the cancer often recurs and becomes resistant to cisplatin, leaving patients with limited treatment options. 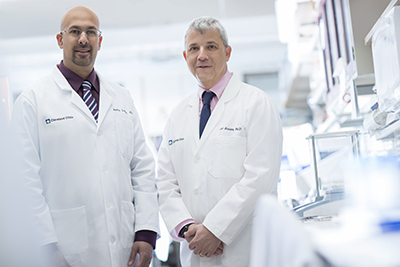 Alvaro Alvarado, PhD, a recent graduate of Lerner Research Institute's Molecular Medicine PhD program, has authored an important publication in Cell Stem Cell that uncovers how brain tumors are able to resist treatment.